The Blu-ray release is titled “6-Film Masters of Terror V.2” and includes the films Halloween: The Curse of Michael Myers, Hellraiser: Hellseeker, Venom, Cursed, Darkness, and Phantoms. 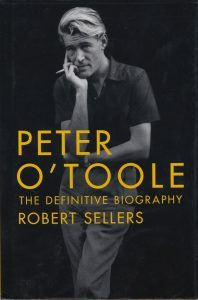 The film’s poster came in two versions. The first has the film logo underground, beneath a street lined with buildings. The second version featured the faces of the four young stars, to capitalize on the popularity of a similar poster done for the film Scream. In March 1998 many DC comic books included a full-page, color reproduction of the original film poster. Phantoms placed ninth its opening weekend grossing $3,065,951 in1859 engagements. 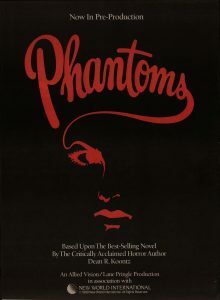 Phantoms has subsequently been re-released on both DVD and Blu-ray in conjunction with other films as with the original Blu-ray release and in a stand-alone DVD release. 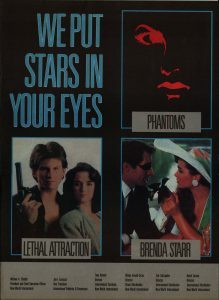 According to an advertisement in a 1989 issue of Variety, New World International had started per-production on a film of Phantoms. Unfortunately, I do not have any additional details about this project or even which issue of Variety this ad appeared in.